The following is a Synopsis, Review and Critique of the 1983 movie "Superman III". Amidst the nervous bustle of the Metropolis unemployment office stands August "Gus" Gorman. After 29 weeks of looking for work as a kitchen technician he has been told that he is no longer eligible for unemployment. Angry, and dejected, Gorman walks away. Stopping to light a cigarette, he borrows matches from another man standing in line and sees an ad for the Metropolis Computer School (Call 123456789) on the matchbook cover. Like the proverbial light bulb turning on above his head, Gus' face lights up as he leaves the office. It is morning in downtown Metropolis. The confusion of so many people making their way to work is accented by the carnival-like atmosphere as the smells of hotdogs and pretzels fills the air. Suddenly, all eyes turn to watch the beautiful Lorelei Ambrosia (Pam Stephenson) walk by in a low-cut, pink polkadot dress. As the men watch her with interest, and the women with disgust, mistakes start to happen, with one mistake leading to another and the madness truly begins: phone booths are knocked over, toy penguins are knocked off of their display stand and people do the strangest things. When one of the toy penguins hits a street torch, it catches on fire. Nearly oblivious to all that is going on around him, Clark Kent comes blithely walking down the street. Picking up the burning toy penguin with curiosity, Kent uses super-breath to blow out the fire. Across the street, an early morning bank robbery takes place. To avoid gunfire from police trying to apprehend the bank robbers, a car jumps the curb crashing over a fire hydrant. Water begins filling the compartment and the driver is drowning in his own car. Kent sees the disaster and steps inside a photo booth to change. While he is changing, a boy [Aaron Smolinski, who played the young Kal-El in Superman: The Movie] drops a quarter in the booth. The flash pops four times, and when Superman emerges, he spies the photos of himself changing. Quickly scanning those photos, he tears off the one photo of Superman alone and hands it to the boy. Quickly flying to the car, Superman rips open the sunroof and pulls the man to safety. Now that everything has returned to normal, or as normal as it can get in Metropolis, Superman changes back to Clark Kent and proceeds to the Planet office. True to his dream, Gus Gorman has enrolled in the Metropolis Computer School, only two stories above street level where all the action has just taken place. The computer instructor is showing the students how to determine coordinates, saying that it is impossible to compute two coordinates at the same time. "But, I just did it", says an amazed Gus. Looking at the computer screen, Gus sets the program in motion and two coordinates flash on the screen. "How did you do that?" asks the baffled instructor. Gus shrugs his shoulder and says, "I don't know." Typically, chaos rules at the Planet offices, and today is no different. Kent has proposed an article about returning home, and wanting to go to Smallville to attend his high school reunion and take Jimmy Olsen along to record it for posterity. Lois is ready to head out for a vacation in Bermuda. To top it all off, Perry has to choose the winners of a Planet-sponsored contest in which the winner receives a trip to Central America. Like an explosion, all the characters head off in a different direction. Kent hates flying commercial airlines, so the two reporters take a bus to Smallville to attend the reunion. As the countryside passes, Jimmy winds the time by droning on about his relatives and Clark pretends to listen. Up ahead, a police roadblock forces the bus to pull off the road. A major fire has broken out at the Smallville chemical plant threatening the whole area. Trying to be ambitious, Jimmy decides to sneak over to the plant and photograph the disaster for the Planet. As Jimmy heads across the highway, Clark slips into the back seat of an occupied police car, and emerges as Superman and flies off. Hearing the door close, the policeman looks around, but seeing nothing he shrugs his shoulders and goes back to paperwork. Flying to the plant, Superman lands to see how he can help. The emergency team points to a number of people trapped on a roof. Superman flies to the roof, and lifting up a smokestack provides them with a slide to safety. To get a better shot of the fire, Jimmy has climbed a firetruck's ladder, but just as he's getting the shots of his life, an explosion collapses the ladder and Jimmy falls to a burning roof. Walking through the flames, Superman picks up Jimmy, taking him to an ambulance. Using his x-ray vision, Superman sees that Jimmy has broken his leg. But the biggest disaster is yet to come. The plant produces "Beltric" acid. Under normal conditions, this is just an acid, but when that substance reaches 180 degrees, this substance becomes a "super" acid and if an explosion occurred it would send a cloud over the area destroying all that it touched. Realizing the peril, Superman flies to a nearby lake, freezes the surface with his super-breath, then flies the frozen lake to the plant. High above the plant, he lets the ice drop above the fire. As the ice falls, it begins to melt when it meets the hot air from the fire. Like rain, the water douses the flames, lowering the temperature and preventing the acid disaster. "Welcome Back Class of 1965" reads the banner in front of Smallville High School. Inside everyone is having a swell time, but even here, Kent is ignored. The rest of the class dances while Clark reminisces with Miss Madison, one of his teachers. "You certainly have grown up, Clark," she says. "I'm a little slow these days, and have dizzy spells�" she continues until, from across the gym, someone catches his eye. "Lana! Lana Lang!" yells Kent. Lana Lang, the girl next door, walks back into Kent's life. Like most of us, time has not always fulfilled the dreams that we had as wide-eyed high-school seniors. The promise of the future fades into the reality of the present. "It's good to see you. Wow! You look wonderful," says Clark. "This is the first time that you've come back to this little berg since your mom died," says Lana. "I heard that you and Donald split up," says Clark with a touch of sadness. Lana had been married and wanted happiness, but realized that Smallville is not the place that she will find it. So far, the only person to show interest in her is Brad, former captain of the football team. Now, all of his fame comes from memories stored at the bottom of a liquor bottle. Obviously, this is not the best of options for a single mother. When Brad comes up to Lana and Clark, he ignores Clark's handshake. "So, remember when you were queen of the prom, Lana? Lot's of guys in line for dances then. But it looks like ol' Brad is the only one on your dance card tonight." "Sorry Brad," she says, "Clark just asked me to dance." "I did?" asks Kent, and Lana maneuvers them out onto the floor. Gyrating strangely to the song, Lana looks at Clark in amazement, but quickly the song becomes a slow number and the two dance closely. It looks like a dream come true for the hapless Kent. It's another payday at Webscoe Industries. When Gus is handed his paycheck, he asks the courier if there isn't a second check for him. "I put in a voucher� for expenses," he says. "Right you are," says the courier and he hands Gus another envelope. Slowly breaking the seal, Gus pulls out a check for $87,789.90. Gus can barely contain his joy. The fondness that Clark held for Lana quickly returns. The day following the reunion, Kent helps Lana clean up the mess from the night before. The more she speaks, the more Kent is attracted to Lana. "I could always talk to you," says Lana. "I wished," says Clark wistfully, "that you had talked to me more... in high school, when you were the Queen of the Prom." Lana turns to clean up a bowl of potato salad. "Three years after the royal wedding, the king abdicated," Lana says. "Why do I stay in Smallville? Do you know how lucky you are living in Metropolis - the Big Apricot? Don't get me wrong. I have a good job. I mean, I'm just a secretary, but it pays the bills. Except when the heating bills went so high last winter. I had to pawn off my diamond ring." Clark looks at her gently and apologizes for the tragedies that befell her. Carrying a pile of dirty paper plates to a trashcan Lana looks up at the wall where enlarged photos of the class of 1965 are hung, and in front of her is Clark's photo. "Years later you can look at someone and say that's the one that got away." Ross Webster, head of Webscoe Industries is interrupted by his accountant who informs him that someone has shrewdly embezzled a large amount from the company coffers. "In the old days," says the accountant, "it was simple. We kept books. We knew what went in and what went out. If someone wanted to rob you, they walked in an said stick-em up. Now with computers�" "But, computers are the wave of the future," says Webster. Outraged that someone would dare steal money from them, Ross Webster's sister, Vera, insists that this person has to be caught. "He's bound to slip up," says the accountant. "No," says Ross Webster, "he'll not do a thing to call attention to himself, unless he's a complete and utter moron." Moving to the window Webster sees Gus squeal into the employee's parking lot with a bright shiny sports car. Lana and Clark take young Ricky to the bowling alley. Brad sits quietly, sadly, behind them, with a beer in hand, stewed to the gills in the middle of the day. Watching Ricky throw most of his balls into the gutter, Brad climbs over the seats. "The kid just needs a few tips from the old champ," says Brad. "I was all county champion two years in a row. Did you know that Kent?". Clark's approach is more subtle and calming. When Kent sees Ricky's apprehension of Brad, he says, "What he doesn't need is a bowling lesson in front of the other kids. Go ahead and bowl, Ricky." When Ricky throws his next ball, Clark hits an ashtray and feigns a sneeze. The power of the sneeze causes the bowl to smash through the pins at an amazing speed. Brad can only look on in amazement. It's a special day at the Planet. Perry is awarding the trip to Central America to the lucky couple. Arranging the picture, his secretary calls Perry to be in the photo. "Why do I have to be in this?" asks Perry. "Why do I have to do this?" asks Jimmy from his wheel chair. "You're lucky that I didn't fire you. You have the chance to get exclusive photos of the biggest chemical fire in history and all you come back with is a broken leg and twelve melted rolls of film." Jimmy just shoots the picture. Back in Smallville, Clark, Lana and Ricky decide to have a picnic. After buying groceries, Clark and Lana pack the station wagon. As they prepare to leave, a bus pulls to the corner and among those to get off is Gus Gorman. Nonchalantly opening the door to help Lana, Kent hits Gorman, knocking the wind out of him. Gus can only limp to the sidewalk, and stare in amazement at the outrageous suits on display in the store windows of Smallville. In typical Kent fashion, Clark mistakes dog food for pate during the picnic. Fortunately, Lana finds this amusing and when Ricky and Buster, his dog, go into fields to play, Clark and Lana are finally left alone. For a brief romantic moment, Lana lets down her guard and become vulnerable. She tells Clark "I'm not going to find what I want in Smallville." Clark comforts her and offers to help her if she moves. As he leans toward her expectantly, the moon-eyed Lana whispers, "My oil pan is dripping." Ignoring Clark, Lana pops up and opens the hood to fix the car, but Kent hears Buster whining. Using his x-ray vision, Clark sees Ricky lying injured, having hit his head on a rock. Seeing a group of combines bearing down on the boy, Clark slips away, quickly changes to Superman, and speeds to Ricky. In the nick of time, Superman arrives, stopping the large blade of the combine before it strikes the boy. Lifting Ricky in his arms, he flies him back to his mother. After Lana thanks him profusely, Superman flies off and quickly returns as Clark holding Buster. Lana tells Clark that Superman had saved Ricky. "Superman, here, golly," says Kent. When she asks him why he is not amazed that Superman was just there, Clark smiles, "Well, gee, Lana. Superman lives in Metropolis. I see him all the time." "Well gee, Mr. Kent," says Ricky, "can you get me his autograph?" Under his breath, Kent mumbles, "If I had a nickel for every kid that has asked me to get an autograph�"
Gus Gorman has come to Smallville on a mission. Gus' job is to sneak into a distant subsidiary of Webscoe industries and use a computer terminal there to get control of a weather satellite and make sure that Columbia complies. Gus bangs on the door of the Wheat King Company, the Webscoe subsidiary, late at night and who other than Brad is the security guard. After convincing Brad that he is there to set up an office bar for the CEO of the company, Gus plies Brad with liquor and both get very drunk. Pretending to be drinking, Gus wears a big cowboy hat, and keeps pouring drinks until Brad passes out. Finding the computer terminal , Gus creates a bit of chaos with other computers, causing ATMs to spit out money, Bloomindales to print erroneously high bills, and wreaking havoc with stop lights before finally gaining control of the Vulcan weather satellite. Somehow, Gus uses the satellite to create weather, rather than simply monitor it, and produces torrential rainstorms, tornadoes and disasters in Central America. Sadly, the couple that had won the Daily Planet's trip is visiting Columbia just as the storms hit. On their rooftop playground, resembling a Swiss ski-chalet complete with ski run, the Websters are ecstatic that their plan had worked so well. "Everytime a drunk wakes up, he'll sober up with Webster coffee," says Ross Webster. "And if we can do it with coffee, why won't it work with oil, too?" But, when Gus returns, their tune is changed. "It's not my fault", says Gus. "What's not your fault?" "Superman. You didn't see the man come flying out of the clouds?" Gus grabs a tablecloth from a table, throws it over his shoulders and tells the Websters how Superman stopped the storms and used his heat vision to dry the land, saving Columbia's coffee crop. Ross Webster is not pleased. "Superman is bad," says Gus, putting on a pair of skis and slowly climbing the ski slope. "We've got to get rid of him," says Webster. "But how," asks Vera. "Kryptonite," says Lorelei, who is much smarter than she appears. Webster quickly hatches a plan to use the Vulcan satellite again; this time to analyze Kryptonite. When Gus suggests that he doesn't get paid enough for this, Webster tells him, "If there's one thing I hate, it's greed." Gus is so startled by this, that he slides down the slope, goes over the ledge, falls down the skyscraper, before hitting an awning, and flies out onto the streets of Metropolis. Having that, "I meant to do that" look, Gus tries to walk across the street with his skis still on. At Webscoe, Gus again taps into the Vulcan satellite, focusing it on the area of space where Krypton once was, and somehow analyzes Kryptonite. The print out appears: Plutonium (15.08%), Tantalium (18.06%), Xenon (27.70%), Promethium (24.02%), Dialium (10.62%), Mercury (3.94%) and UNKNOWN (0.57%). "Unknown," thinks Gus. "What's unknown?" Glancing down at his cigarette pack he sees a word, and replaces UNKNOWN with TAR. Handing the list to the Webscoe laboratory chemists, they return with a green crystalline rock. Back at the Planet, chaos rules again. The couple that had won the trip, fly into the office in a rage. "We'll sue," they scream. But, in a quiet corner, Clark writes his article on returning to Smallville. "The prettiest girl in school is still the prettiest girl in school," he begins. As if on cue, Lana calls Kent. Ricky has told everyone that Superman would come to his birthday party and Lana is hoping that Clark can arrange for Superman to be there. "Speaking for Superman, tell Ricky he'll be there," says Clark. "Superman's wonderful but, Clark, you're the greatest," says Lana. To celebrate Superman's rescue of little Ricky, the town of Smallville holds a celebration in Superman's honor. At the dais, Superman is given the key to the city, and just when it appears that the ceremony is complete, Gus and Vera Webster arrive in a jeep, posing as representatives from the army. Gus gives an impassioned speech, which makes no sense, until he thanks Superman for saving the whole East Coast from the chemical fire. Gus hands Superman the synthesized Kryptonite as a gift. Curiously, Superman does not respond to this green crystal which looks just like Kryptonite, other than a polite nod. Even stranger, this Kryptonite has no effect; at least not at first. When Gus calls Ross Webster to report in, Webster is furious. "Superman didn't die. I ask you to kill Superman and you can't do that one simple thing?" The synthesized Kryptonite did not kill Superman, but it still had an effect. Slowly, Superman's character begins to change. At first, the change is subtle. After the reception, Superman goes to Lana's house for the lunch she had promised him. After eating, her telephone rings, and Lana returns to tell Superman that a truck had been involved in an accident and is about to fall off the edge of the bridge. Superman doesn't seem to be in a hurry, "I always get there in time, " he says. "Come on, lets relax a little. It's unusual to find a good looking girl like you alone like this." Lana appears very nervous when Superman puts his arm around her. "Shouldn't you do something about the bridge?" she asks. "What bridge?" he asks. Then, as if catching himself, Superman straightens and says, "You're right. I should be going." Streaking to the bridge, Superman arrives just as the truck plummets into the river beneath the bridge. Landing, he asks a sheriff, "What can I do to help?" "Not much now," says the disgusted officer. "If only you'd gotten here a minute sooner." Suddenly, Superman begins acting strangely... evil. Flying to Italy, he straightens the Tower of Pisa, then at the opening ceremonies of the Olympics, he casually blows out the Olympic Flame. All the time, his costume continues to get darker and darker. Back at Webscoe, Ross Webster has Gorman begin implementing his plan to monopolize worldwide oil supplies. Gus balks, explaining that he needs more. "When do I get a taste?" asks Gus. A compromise is struck. In return for Gus using his computers to order every oil tanker to sail to a fifty mile area in the Atlantic, and to transmit an irreversible command to stop pumping oil and gas, Webster will fund Gus's plan for the ultimate "Super Computer." "What will it do," asks Webster. "Whatever you tell me to tell it to do," gloats Gus. Following the orders Gus has sent, all of the tankers head for a small area in the Atlantic, save the British Reliance, which continues to head to Metropolis. Circling over Metropolis, the dark Superman notices search lights playing over the Statue of Liberty, and rescue squads preparing for another "jumper". Landing on the statue, Superman sees Lorelei sitting with her leg dangling over the edge, the wind casually blowing her hair and dress. "I hope that you don't expect me to save you," Superman says. "I don't do that anymore." "Oh, I'm way past saving," whispers Lorelei. Looking coyly over her shoulder, Lorelei coos, "Don't let me keep you." "I'm in no hurry," leers Superman. "What did you have in mind?" "Lots of things," says Lorelei, "if you do one little thing for me. There's this little boat that's not going where it's supposed to go..."
Flying swiftly above the wave tops, Superman comes across the tanker British Reliance and savagely rips a hole in the side of the ship producing a spreading oil slick in the middle of the ocean. Having finished his task, Superman returns to Webster's penthouse. Lorelei, dressed in a flimsy dressing gown greets him. Jazz plays in the background, as Lorelei opens the champagne and offers him a glass. Ignoring the drink, Superman grabs Lorelei and passionately kisses her. This is not the Superman we know. In the meantime, gas has become a precious commodity. Tempers flare, and fights erupt as lines form at the gas pumps. "Somebody's behind this. You can't tell me there's no oil. Somebody's getting rich." Indeed, and it's Ross Webster who uses some of his new wealth to begin building Gus' computer. Back in Smallville, Lana continues to rebuff Brad's numerous advances. "You'd better start appreciating ol' Brad," he tells Lana. "What else have you got in Smallville?" That question makes Lana realize that the answer is "Nothing!" Picking up the phone a second time, she orders two tickets for the next flight to Metropolis. Superman's costume is now a very dirty blue and several days growth of stubble is on his chin. Despondent, sitting at a bar, he sadistically flicks peanuts at the liquor bottles on the bar, smashing them with ease. Looking into the mirror he see his surly reflection staring back at himself. In an act of disgust, the mirror melts from a blast of heat vision. Coincidentally, Lana and Ricky have just arrived in Metropolis and are in a taxi heading through town. When Ricky sees Superman stumbling out of the bar, he jumps out of the taxi. A crowd lines up to gawk at the fallen Man of Steel. "Hey look! Superman's drunk!" Ricky calls out after Superman, but he turns, running down the street, finally taking off into the sky. Ricky's cries echo in Superman's ears. "Superman. You're just in a slump. You'll be great again." Weakened and disoriented, Superman nearly falls into a junkyard and, dropping to his knees, lets out a primal scream. Slowly, Clark appears, just walking out of Superman's body and the two sides of Superman now exist at the same time and look fearfully at one another. The dark Superman assumes that his powers are unchanged. "You always wanted to fly Kent"; says the evil Superman, who picks up Kent and throws him a railing. But Kent is dazed, not injured. It appears that Kent has some powers as well. "I can give as good as I get," says Kent throwing Superman into an acid bath. Superman flies out of the bath and blows the acid at Kent. His coat literally is burned off of his chest. Grabbing the advantage, Superman throws Kent into a car crusher. The hydraulics whine, and begin to close over Kent. Suddenly, the whine increases, as Kent forces the jaws apart, breaking out of the device. The evil Superman stumbles away, seemingly weakened and Clark grabs a pile of tires, throwing them, one-by-one over Superman's head. Enraged, Superman rips through the tires and seeing that Clark is standing beneath the electromagnet hanging from a crane, burns through the cable allowing the weight to knock Clark into the dirt. Curiously, with each battle, Clark seems strengthened and now climbs out of the hole. Again, the evil Superman grabs Clark and throws him into another car crusher. As the machine starts, Superman crushes Kent's glasses, a symbol of Superman's weaker side. But again, Clark crashes out of the machine and this time Kent's fury rages, grabbing Superman around the neck. Suddenly, the dark Superman fades. Clark stands erect, whole again. Ripping open his shirt, revealing the brilliant blue costume and red pentangle, the rejuvenated Superman flies off. Flying swiftly above the wave tops, he finds the British Alliance, still spilling oil. Using his super breath, Superman blows the oil back into the tanker and welds the bulkhead plates with his heat vision. The crew watches in wild-eyed surprise, as Superman waves, and flies away. Returning to Lorelei's cabin, Superman triggers a switch when he enters the door. Vera comes on the TV screen, taunting Superman to try to stop them, even showing him exactly where they are. As Superman heads west to confront the Websters, The Websters make their way to the cavern containing the super computer. While Ross, Vera and Lorelei use a balloon to lower themselves to the cavern below, Gus decides to ride a mule. "I just don't believe a man can fly," says Gus. There is no explanation where this computer came from, or it's power source, but nevertheless, in the middle of nowhere is a huge computer system. When Superman arrives at the canyon, Webster begins launching missiles at him, much in the fashion of a video game, even scoring points along the way. Superman evades most of the missiles, save a cruise missile, which slows him for a second, but after recovering, he quickly finds the hidden cave. "Hi Honey," says Lorelei. "I don't know you," glares Superman. "But the other night...?" she pleads. "I'm sorry, but that wasn't me. That guy is gone," he says. Superman warns the group to surrender. "Me? Part of the group? Not me. I'm not part of the group," implores Gus. Superman moves toward the computer, and the computer retaliates, emitting a beam from a projector, which puts Superman in a force field. "Let's see how long Superman can live without air," asks Webster, but Superman uses his heat vision to slice through the field, freeing himself. Again moving forward towards the computer, it retaliates back by firing a Kryptonite ray. "We figured it out this time," yells Vera. Gus and Lorelei are appalled, asking for them to stop. Turning to Gus, Ross Webster yells, "You'll go down in history as the man that killed Superman. More Power!" Deciding that he must stop this travesty, Gus slides down a cable to the cave floor, and attempts to disable the computer by cutting its power. That works for a second, but then the computer suddenly takes on a life of its own, seeking out power by drawing from all of the electrical power up and down the coast. Major cities come to an immediate halt. With no other option in sight, Gus takes an ax to the Kryptonite projector. But, once free, Superman flies away. Gus is left helpless and alone, and the computer uses a force beam to lift Gus and slam him into the cave wall. When Vera comes down to the cave floor from the control room, the computer literally grabs her, attaching circuit boards to her face and making her a human computer. Quickly flying to the chemical plant, Superman returns with a vial of Baltric Acid. Scanning Superman when he returns, the computer does not view the now inert acid as a threat, and renews its attacks on Superman. But pulling off the lid of the acid vial, Superman heats the acid. Within seconds, the acid corrodes the computer to the core, and the computer explodes into sparks and shards of metal. Emerging from the wreckage, Superman finds Gus. "Thank you, brother," says Gus. Curiously leaving Ross and Vera Webster and Lorelei Ambrosia in the cave, Superman flies off with a nervous Gus. "What happened to my computer," asks Gus. "I guess it died of acid indigestion," replies Superman slyly. Skimming over the trees, Superman sees a coalmine, and lands there with Gus. Walking over to a pile of coal, he grabs one piece and uses his super strength to make a large diamond in his bare hand. Getting ready to take off, Gus tells Superman that he'd prefer to walk. Turning to the miners, Superman tells them that they could do worse than hiring Gus Gorman to man their computer, but Gus is not ready to settle down there. After Superman flies off with a friendly wave, the miners turn to Gus. "Do you really know Superman?" the miners ask. Gus rips open his shirt, and says, "You don't know about me and Superman? Man, we always, sometimes, once in a while, hang around together. Brother, which way is that bus station?" Back in Metropolis, Clark knocks on the door of Lana's hotel room. "Guess who my mom is having dinner with, Mr. Kent?" exclaims Ricky. "Superman." "Well that's why I'm here," says Clark. "Superman can't be here for dinner tonight. Mind settling for me?" "Not in the least," says Lana. "Let me get my coat." "By the way," Clark says, "Superman felt kind of bad when he heard that you had to pawn your diamond, so he wants you to have this," placing the huge diamond Superman had made from the piece of coal on her hand. Lana is flabergasted, as Clark gets down on one knee to put the ring on her hand. Ironically, just as Clark puts it on Lana's hand, Brad bursts through the door, and seeing Kent putting a diamond on Lana's hand, sends Brad into a rage. "Kent I hate you. You know why? Because you're nice, and nice guys finish last." Brad takes a swing to hit Clark, but Kent ducks and Brad ends up sprawled on a table. This only enrages Brad more. Leaping up, Brad runs at Kent, but Clark sidesteps him and uses a bed to propel Brad out the door and onto a cart, which rolls into the elevator. Back at the Planet, Lois has returned from her vacation. "Lois, I've got to hand it to you. Who else could turn a two week vacation into a front page story that could blow the lid off of corruption in the Caribbean?" exclaims Perry. "I knew something was wrong when the taxi driver kidnapped me," explains Lois. "Great story," chimes in Kent. "Well I had to come up with something," she says smiling like a Cheshire cat. "'Looks like I've got some competition. Your story on Smallville was great." Lois suggests that they to go to lunch, but Clark explains that he's going to lunch with Lana Lang, Smallville's newest addition to the Planet. When Lana comes into the office, Lois notices the huge diamond on Lana's finger. "Oh, Clark gave it to me." "Clark?!?" exclaims Lois. She can only stare in wonder as the two walk out the door. In an effort to correct all of the things he had done under the influence of the synthetic Kryptonite, Superman flies back to the Tower of Pisa, putting it back to its correct lean. That's good for history, but bad for the small Italian vendor that has just received statues of the "upright" Tower of Pisa. Swearing at Superman in Italian, the vendor borrows a broom from his friend and smashes the statues on the concrete. Above the clouds, Superman flies over the earth keeping watch. In a graceful sweep, he flies into our line of sight. He has returned after going astray, and is now ever vigilant, always watching. He will always be there, because the fight for good never ends. Perhaps it was an omen that this movie begins without the Superman logo and John Williams' theme, that began both Superman I and II, but rather with just the Warner Brothers Logo. The vitality of the previous two Superman movies was now as completely uninspired as the soundtrack. While director Richard Lester had done reasonably well with Superman II, he returned to his slapstick comedy roots with Superman III. Having previously directed such films as Help, A Hard Day's Night, A Funny Thing Happened On The Way To The Forum, Butch and Sundance: The Early Years, The 4 Musketeers and Robin and Marian, Lester must have felt that by securing Richard Pryor in the cast that he would have a sure-fire winner. The trouble was that Lester moved away from what made the first two films so good, to essentially re-write the Superman mythos with different powers and plain silliness. Margot Kidder appeared in only two scenes in this film, opting to sit out over a salary dispute. As the producers did when faced with a salary conflict with Marlon Brando, they opted to use a different character (Lana Lang) in her stead. Kidder did return for Superman IV. The only redeeming quality of this movie is Reeve's portrayal of Superman, which remained amazing consistent across all four films. Several critics have claimed that the climactic battle between the evil Superman and Clark in the junkyard was the highlight of the four films. While Superman I and II each contained large plot flaws, Superman III was fraught with inconsistencies and things which made no sense. It is left to the viewer to rationalize how simple minded Gus Gorman could be such a genius with computers that he, himself, did not understand how he was able to accomplish some of the feats he did. Certainly, no weather satellite we possess today can create weather, and a sane Superman would at least question someone trying to hand him a glowing, green crystal resembling Kryptonite. Still, this film has some redeeming qualities. Richard Pryor's Gorman was endearing, if nothing else. To me, the character that stole the show was Annette O'Tooles' Lana Lang. Her Lana seemed to validate Superman as Clark Kent. Time after time, Lois would denigrate Clark while regaling Superman, but Lana could see the goodness in both. After viewing this, I came to wish that O'Toole would return in a future Superman movie rather than Margot Kidder. Unfortunately, that was not to happen. 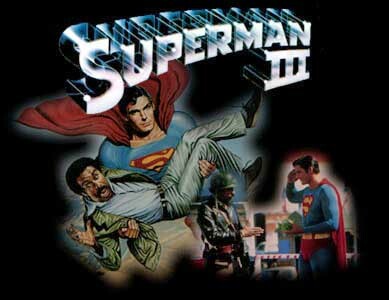 The theater release of SUPERMAN III ran approximately 2 hours and 5 minutes (125 min). In 1986, ABC presented an extended version of this film, which ran only once, adding 16 minutes of footage to beef up the action and demeanor of the film to run 2 hrs and 21 min (141 min). Gone was the dynamic and astounding soundtrack of Superman and Superman II. In Superman III, Williams' brilliant soundtrack was nothing more than background music, practically wiped out by the beginning of this movie, in which all the action is occuring. During the movie, the audience is witness to more 70s music than anything else and the parts where there is a soundtrack, lacks in volume and power. It doesn't appear to work with the movie and is one of the many disappointments in this installment. Relatively good. The effects are believeable, and although sometimes corny looking, are, for the most part, quite interesting. A few scenes come to mind, such as the junkyard, fire and ending scenes, in which Superman fights the giant computer. Unfortunately, this movie shows its age better than any of the others, and this takes away from the effects. When watching a movie such as this, the audience should feel as though it were either occuring in the present or the future. Science fiction films rarely try to appear as if they took place in the past, as this does with the 70s music and bellbottoms. Pryor's performance as a well-meaning but incredibly stupid fool was played very well. If Pryor's goal was to do this, he succeeded. I think that everyone will agree that Pryor gets a "5" on that. However, Gorman's role was pointless and unimportant to the story. Any idiot could have filled his position and done the exact same, except that Gorman wasn't an idiot. He was able to program computers to do whatever he wished, which of course makes no sense, whatsoever, but then, this movie didn't either. Certainly better than Kidder's performance as Lois, O'Toole's Lana Lang was very good. Lana was finally a different person than Lois, a fact that many comics and past productions have messed up with. Lana was played as a type of naive country girl who was likeable and interesting. Two traits that Kidder's Lois never had. I really disliked this character. All that he did the entire film was act like a Lex Luthor wannabe who was much too egotistical and incredibly stupid. Nowhere near as interesting or as fun as Hackman's Luthor, Vaughn acted extremely corny and was less interesting than Pryor's character by far. Luthor should have been in this one. Although, I'm not sure that would have even helped. "What?" You say? "A "2" for something this bad?" Yes, it was bad, but "2" seems fair. The good thing about this movie, though, is that it started out fairly okay. One would even say that it was interesting and fun up until Superman returns from his "bad mood." After that, it just gets extremely far-fetched and the humor goes thin. Then, a preposterous plot gets even more convoluted and impossible. The whole video game experience at the end and Vera turning into a cyborg is extremely stupid. There are some points to this movie, however, that can be enjoyed. I found myself giving a chuckle or two after seeing Pryor in that stupid cowboy hat halfway into the movie. Some of the jokes and comic scenes are somewhat fun and laughable. Unfortunately, that's all this movie is. There's very little "true Superman" going on. We see him get mixed up by the greenish "red" Kryptonite and when he changes back, it's still what it was before. The only thing that saves this movie is the few interesting jokes and the fight between Kent and Superman in the junkyard. I find that scene to rank with the best of the Superman movies and find it truly interesting and controversial. Is Superman actually fighting Kent, or is this going on inside his mind? After all, he IS drunk. Other than that, though, like I said before, this script is "laughable." Well, it's a comic book plot. A BAD comic book plot, but nevertheless, there it is. The guy who can't get a job and deep down inside is really good, teams up with a rich guy who wants to take over the world. The first guy has special powers and uses them against the superhero. In the end, however, he realizes that he's done the wrong thing and saves the superhero and stops the crook. Sounds like a comic book plot to me, and it might not have been that bad if the other parts of it had been fine-tuned. This movie could have been pretty good, maybe even good, but it just kept getting really weird and bizarre. At least they didn't change any of Superman's powers though, and the "red" Kryptonite was certainly an interesting addition. Superman III was incredibly lame. The story hardly held together (some would argue it didn't), the soundtrack was blotted out by terrible 70s music (no offense to disco fans), it was all humor and no action or adventure, and the special effects were all that held it together. It was also the movie where Metropolis turned into a fun, joyful town, losing its grim and dark appearance, and where everyone in the entire movie was incredibly stupid, except Superman. Plus, this movie couldn't have shown its age better if it had had the date it was done, take up the entire screen, in neon colors, before the opening credits. The computers, bell bottoms and music gave away everything and the only fascinating parts of it were seeing Smallville again and seeing Superman fight himself in a junkyard. A junkyard... hmmm... that sounds like a good place to put this movie!